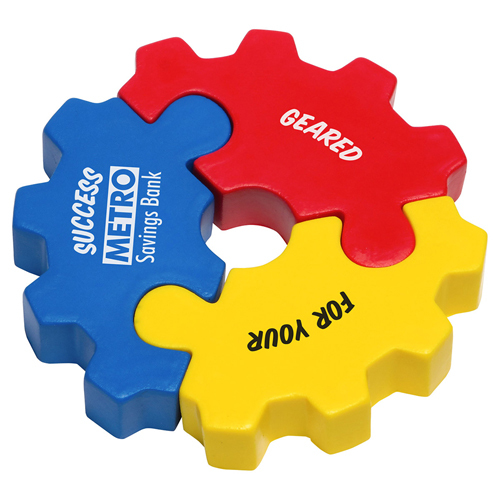 You can "gear" up for your next promotional campaign with this gear puzzle set shaped stress reliever. Measuring 4" in diameter and 11/16" thick, this eye-catching therapeutic aid features three different colored pieces (Blue, Red & Yellow) that fit together into one gear-shaped finished product.It is a great handout for auto body shops and garages, car dealerships and more, and it can be customized to your liking with an imprint of your brand logo for increase corporate awareness. Individually bagged, / 300 pcs. / 24" x 13" x 14"box. Imprint Area: 1" x 0.875"